“Stop! We’re going the wrong way!” I yelled as cars and buses came to a screeching halt. That’s how our latest trip to Jamaica started as we left the airport in Montego Bay and drove into a rotary going the wrong direction. Who knew that when driving on the left side of the road with the steering wheel on the right side of the car, the rules of the road also change—one enters a rotary from the left, not the right? It’s potentially a deadly mistake, but we were lucky and the traffic stopped as we turned and continued our journey through pothole-filled, narrow mountain roads towards the southeast coast of Jamaica and the peaceful and less touristy Treasure Beach. Three hours later and just in time for a magnificent sunset, we arrived at our destination, the delightfully intimate Jake’s Hotel. My goal for this trip was to learn how to make authentic Jamaican jerk chicken—for 100 guests at our son’s and his fiancee’s Jamaican-themed summer wedding at High Pocket Bed and Breakfast in the hills of Colrain. Traditionally, Jamaican jerk chicken starts with a marinade made from chiles, cinnamon, ginger, thyme, garlic, allspice, clove and onions. After hours of marinating, the chicken is grilled on an open fire over pimento wood. Finding the best recipe for jerk chicken varies as much as finding the best recipe for meatloaf, lasagna or chocolate chip cookies. I figured that tasting the jerk chicken from the roadside vendors on our way to Treasure Beach and staying at Jake’s would be the perfect way to get the needed “tasting experience” to recreate an almost authentic recipe here in the U.S.
Jake’s is by far one of the coolest and most sustainable properties in all of Jamaica. 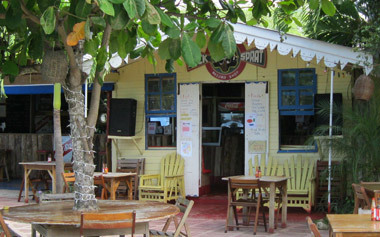 With a mantra of “Eat what you grow, grow what you eat,” the two restaurants on the property, Jack Sprat and Jake’s Country Cuisine, serve classic Jamaican dishes and seasonal fish, crab and lobster that adhere to their eco-friendly standards. Much of the produce served comes from Jake’s own organic garden. There are also plenty of Rastafarian-inspired vegetarian options, and desserts and ice creams are homemade in their kitchen. Chef Dockery Lloyd heads Jake’s kitchen. One steamy Jamaican afternoon he taught me how to make perfectly flavored, oven-roasted jerk chicken for a whole lot of people. I’ve doctored the recipe a bit for ease of obtaining ingredients here in New England (and for a smaller crowd!). Serve it with skillet corn bread, your favorite coleslaw and of course, plenty of ice-cold Red Stripe beer. Beth Shepard is the principal of Beth Shepard Communications, LLC, located in Gill, Mass., a spokesperson and consultant agency specializing in working with culinary and nutrition professionals. For more information, e-mail Beth@BethShepard.com. Place the lime juice, jerk seasoning, coconut milk, chicken broth and all the chicken in a glass, plastic or stainless steel bowl. Stir to coat the chicken. Cover with plastic wrap and refrigerate for a minimum of 2 hours or overnight. Place a metal rack in a large roasting pan and spread the chicken out in a single layer on the rack. Pour the leftover marinade over the chicken. Loosely cover the pan with aluminum foil. Bake for 1 hour or until the chicken is tender and the meat separates easily with a fork. Remove the chicken and place on a deep serving platter or other deep sided pan. Cover with foil and set aside. Remove the rack and leave the drippings on the bottom of the roasting pan. Place the roasting pan with the pan drippings on top of the stove over two burners. Turn the burners on simmer/low heat. Bring the jerk sauce to a boil for about a minute. Use a metal whisk to stir until the cornstarch dissolves. Reduce the heat to a low simmer and gently whisk the jerk sauce until it thickens and reduces by about 1/3. Pour some of the jerk sauce over the chicken and some into a small bowl to serve at the table.